As I was driving home from work today, I got to thinking about Star Wars. In the monotony of my commute, I often drift away to a long time ago, in a galaxy far, far away. Today, I was thinking about the stand-alone movies that Disney plans to make. I am sure that we are going to get a Boba Fett movie, a young Chewbacca meets young Han Solo movie and maybe even a movie that chronicles the rise of Bill Tarkin from Junior Associate Moff all the way to Grand Moff. Those will all be fine, but what I really want is an Obi-Wan Kenobi movie. There are several reasons why this movie could be great and I will get to them. First, I have a stipulation. Get something to write with, J.J. 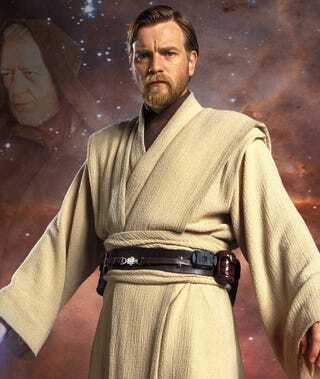 The Obi-Wan Kenobi movie must star Ewan McGregor. Why? That's easy. Think about The Phantom Menace, Attack of the Clones and Revenge of the Sith. Sorry you had to do that, but it's important. What was the best part about those movies? That's right, it was McGregor's performance as a young Obi-Wan Kenobi. And do you know what's heartbreaking? That performance was wasted acting opposite Hayden Christensen and Jar-Jar Binks. He deserves a chance to play Obi-Wan in a great movie with great dialogue. So how do you make a great Obi-Wan movie? Well, Disney apparently wants to make all of these movies origin movies, but other than the aforementioned When Han Met Chewie film, who cares about the origins of minor characters? Lucas already messed up the origin of Boba Fett. Plus, McGregor is a little too old to play teenage Obi-Wan. So why not tell the story of what he did for the nineteen years between Revenge of the Sith and A New Hope? I don't believe he spent those years on Tatooine learning how to make Krayt dragon noises. Maybe he was secretly aiding the Rebellion or sabotaging the Empire's search for Luke. We know that Vader spent these years hunting down the other Jedi; maybe Kenobi was helping them. Maybe I'm crazy. Maybe nobody cares about Obi-Wan. Maybe we just to watch an hour and a half documentary about the factory where they built HK-47. But I think that this idea could be great. The balls in your court, J.J. Do the right thing.